To serve the church by creating and initiating wholesome, spiritual and recreational programs for children 12 years old and under, that will encourage and promote good habits, strong minds, healthy bodies, and a desire to live godly and productive lives. • Must be a good role model/mentor with no criminal record of child abuse and must lead by example in faithfulness, attendance, and stewardship. • Preside at regularly scheduled meetings and lead in the department of staff, policies and policies and procedures, meeting monthly with children ministry leaders to pray and identify the needs and interest of children within the church and the community and to discuss upcoming events, challenges, solutions, and praises. • Create, initiate, and implement programs that are specifically designed to inspire children and lead them to Christ. • Challenge the children to acquire Christian character and discipline, proper church conduct, a sense of self-worth, fair-play, and an appreciation and respect for others through wholesome physical and mental recreation. • Inform the children and their parents, well in advance, of any activities for the entire year and distribute a Calendar or Activities list to the administrative staff, parents, Children’s leaders. • Recruit volunteers to become Children’s Activities Assistants to help oversee and carry out yearly activities volunteers should be rotated to serve at different times with specific activities. Conduct annual background checks on all Assistants and volunteers. • Provide training opportunities for children workers as needed, and plan one major training/inspirational workshop a year. • Maintain a vital and growing personal walk with the Lord through committed bible study, prayer and personal meditation. • Financially support the work of VBM by faithfully tithing (10% of your income). Maintain wise stewardship measures over the remaining 90%. Teach the Children’s department the importance of tithing and giving. • Promote and support the overall vision of the Pastor to all Children’s Ministry participants. 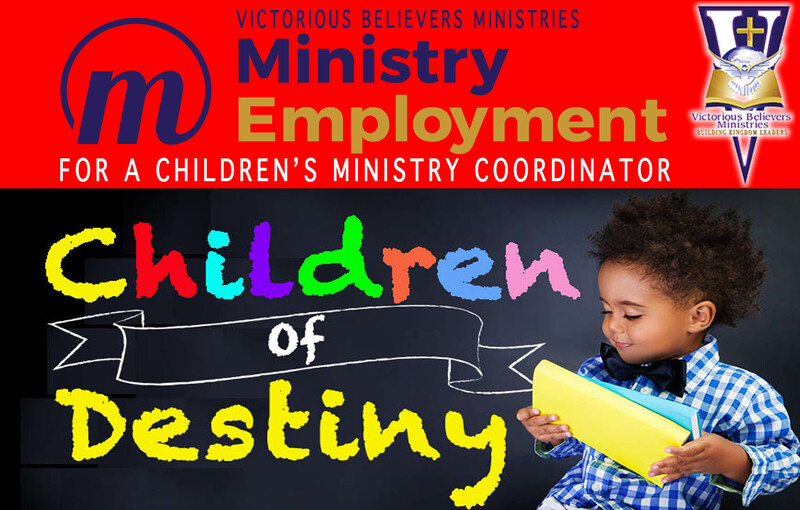 Performance of this job will be evaluated by the Pastor and/or the Senior Director of Ministries in accordance with the provisions of the Employment Policies established by Victorious Believers Ministries. Send your resume to humanresources@victoriousbelievers.com.